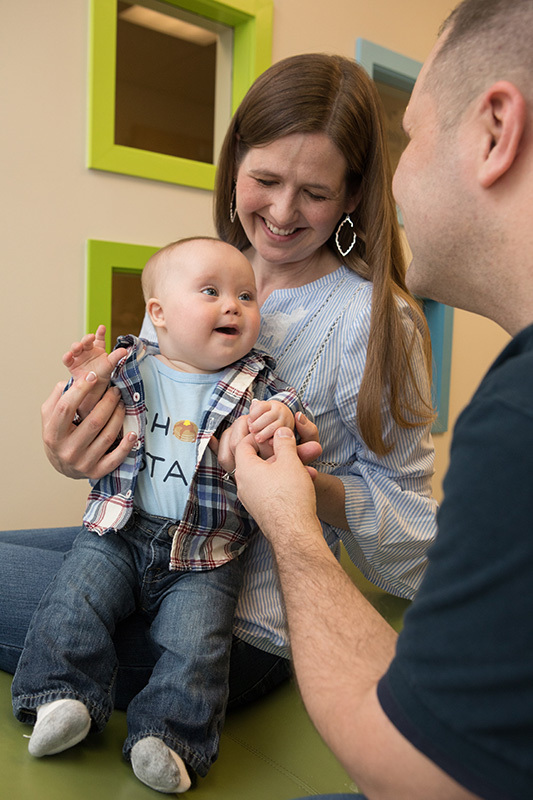 When pediatrician Rebecca Partridge, MD, and her family moved to the Seattle area in 2008, finding a doctor for her son who has Down syndrome topped her list. But she was in for a surprise: no primary care Down syndrome program existed. Dr. Partridge got the names of good pediatricians, but none had expertise caring for children like her son. Rebecca Partridge, MD, helps families look forward to the joy and wonder of seeing the world through their child’s eyes. So when Dr. Partridge joined Virginia Mason in 2012, she found the organizational support to create that place. Today, the Down Syndrome Program at Virginia Mason Issaquah Medical Center provides a medical home for patients and their families, offering not only primary care, but specialties including audiology, ophthalmology, sleep medicine and an onsite laboratory. A dedicated nurse coordinator manages referrals and test results, supporting families with continuity of care and the knowledge to meet their children’s unique health needs. Better management of health issues linked with Down syndrome – ranging from hearing, vision or respiratory problems to conditions affecting the heart, thyroid or digestive system – is a key reason people with Down syndrome are living longer, more productive lives. Physical and speech/language therapies started during infancy and early childhood promote better function and social development. A nurturing home life, access to mainstream education and positive support from the larger community mean more adults with Down syndrome are living successfully well beyond midlife. Jack and his parents, Christopher and Michelle Peterson, are enjoying the great adventure that is his childhood, thanks to the support of Virginia Mason Down Syndrome Program. Currently, Dr. Partridge sees patients until their 26th birthday, but plans to expand adult care are in the works. Listening sessions are ongoing, where families who have children with Down syndrome, and adults with Down syndrome, are invited to share what they want and need in an adult care program. “There’s definitely a lot of excitement in the community, and there’s definitely a huge need to serve adults now,” says Dr. Partridge, who is seeking to partner with a new provider dedicated to caring for adults. Dr. Partridge helps parents in another way that is unique to the Down syndrome program: compassionate support before the baby is born. Parents-to-be with a prenatal diagnosis can make an extended appointment, free of charge, to learn more about their baby and what to expect. Dr. Partridge speaks as a physician and as a mother who went through the same experience with her son. During these visits, parents begin to process the changes to come. There’s space to talk about grief, what the early days and months will look like and what support services are available. As the mother of a teenager with Down syndrome – a young man who loves computers, shooting three-point baskets and hanging with his best buddies – Dr. Partridge can help them look forward to the joy and wonder of seeing the world through their child’s eyes. Your child will have distinct strengths, she tells them, because he or she will experience life in a different way.